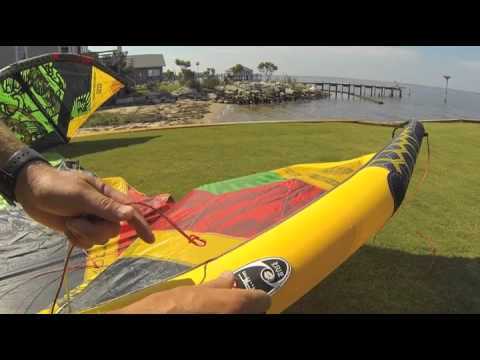 The Epic Renegade LTD V3 is a 13 square meters kite introduced a few seasons ago. Its aim was to deliver superior power, beyond that of the standard Renegade kites (the largest Renegade has a size of 11 square meters). The Renegade 13 LTD has been refined each season and today it is a reliable all-round machine that excels in lighter wind conditions. It is perfect for waveriding, as well as for freeride, wakestyle and freestyle. The Epic Renegade LTD opens a new world of kiteboarding to all riders out there. It is engineered to deliver consistent power and has an awesome low end that makes it extremely efficient in lighter winds. It is the kind of kite that allows you play in marginal winds with ease. It takes advantage of any wind blow to deliver solid energy. The Renegade LTD V3 features a slightly thicker leading edge that makes it very crisp in the air and also improves relaunch. It uses a three strut configuration to assure excellent stability. The struts are thinner to lower overall weight and make the kite quicker in the window. The multiple bridle point attachments allow the rider to choose the best setting according to his or her style. For instance, the freeride setting moves the kite closer to the edge of the window for better wakestyle and boosting performance. The wave setting places it deeper in the window for better positional feedback while depowered. The Renegade LTD V3 provides instant relaunch and huge depower. It is also able to boost huge and floaty lifts, even in marginal winds. It also turns pretty fast for its size and holds good power in turns. It is powerful, but also user friendly, so it can accommodate any rider. Tried it and loved it. Good speed, good boost, excellent maneuverability. I made my mind in 20 minutes. I got to buy it!